Every year Lucy tells Charlie Brown that she’ll hold the football for him while he kicks it. We all know how that works out. Another “Definition of Insanity” Moment. This week I felt like Charlie Brown, with Bank of America holding the football. The football was my new Bank of America Debit card, which arrived in the mail appearing to be an EMV CHIP and PIN card. Wow, I’ve been jones-ing for a real Chip and PIN card ever since I had my cards declined while traveling in the UK several years ago, and here it was! Other banks have sent me ‘Chip’ cards over the past few months, but they all turned out to be Chip and Signature not Chip and PIN. In addition to not being as secure as Chip and PIN, Chip and Signature cards are not accepted at many establishments when you leave the good old US of A. For example, many stores, restaurants, trains, and gas stations will require you to come up with cash in lieu of your antiquated US credit card. Here is the brochure that accompanied my new Debit card. 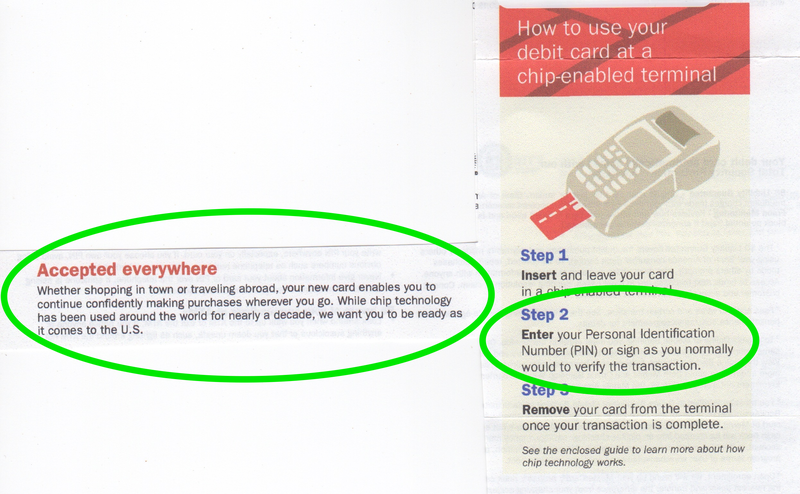 As you can see the card remains in the reader while in Step 2 you enter your PIN number. Finally, my problem and that of millions of other B of A customers has been solved, with a card that is accepted all over the world. Brilliant. Cash… Don’t Leave Home Without It.